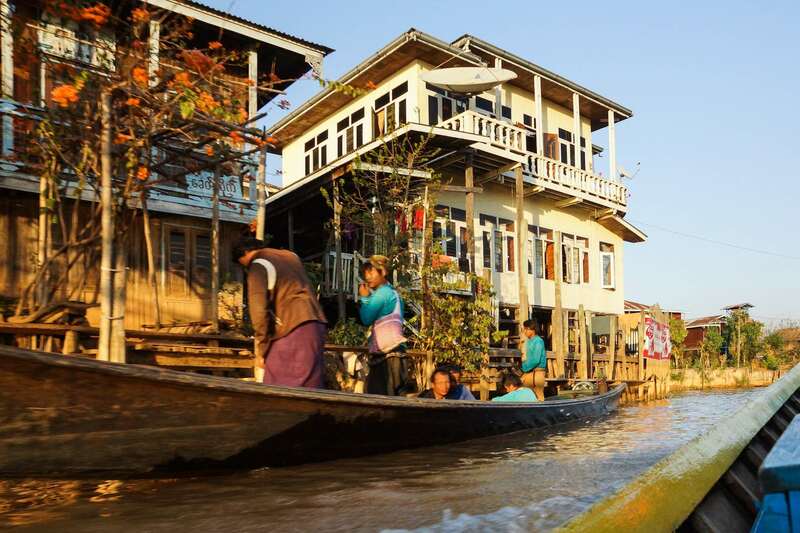 Skim through any tourism guide-book to Burma (i.e. 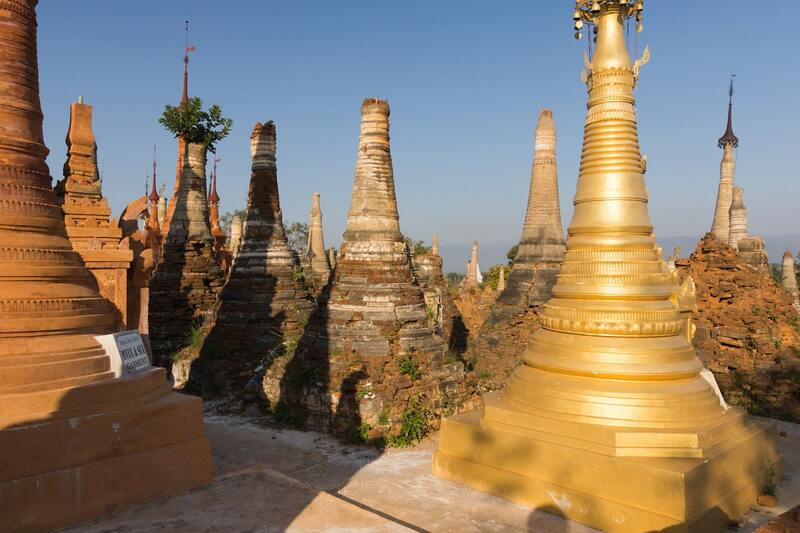 Myanmar) and a handful of places make the “do not miss” category. 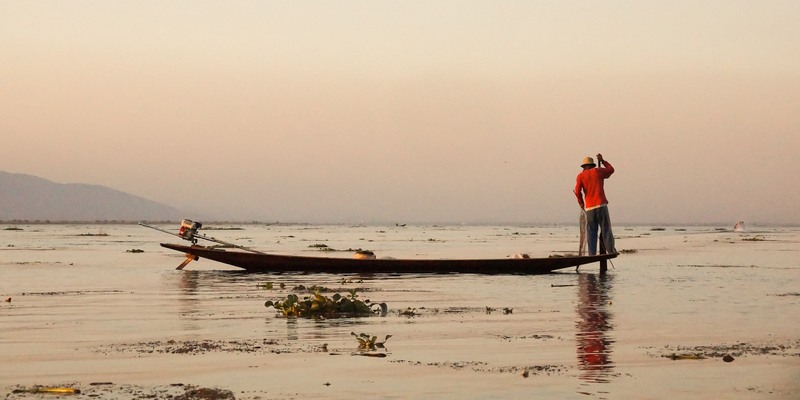 Yangon, Mandalay, and Bagan are sure to be on the list. 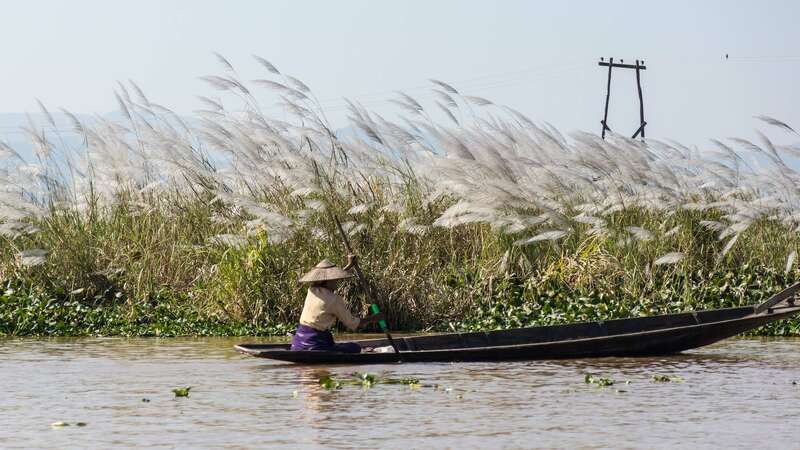 Another top destination somewhat less known is the Inle Lake region in Shan State. The main activity involves boat trips up and down the lake. 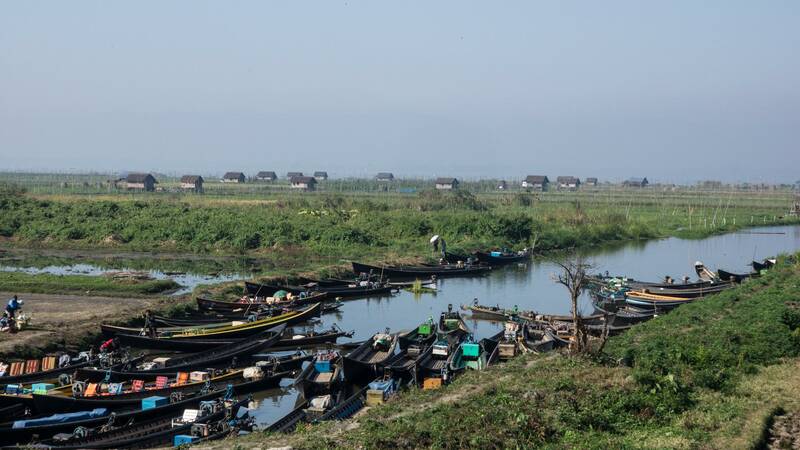 Myanmar’s second largest, it stretches about ten kilometres from north to south and is about four kilometres wide. Four meters (15′) is apparently its deepest point. 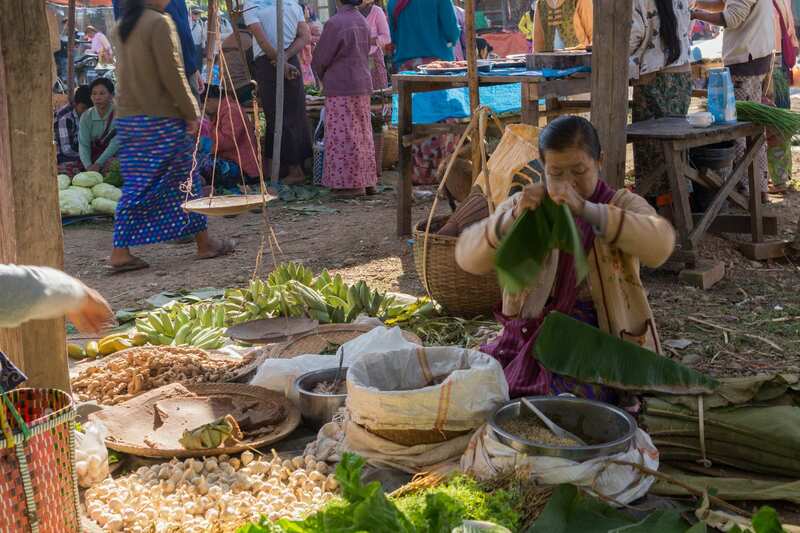 As well as the lake itself, there are shore visits to various villages, crafts cottages, temples and stupas, and the local markets whose locations rotate on a five-day cycle. 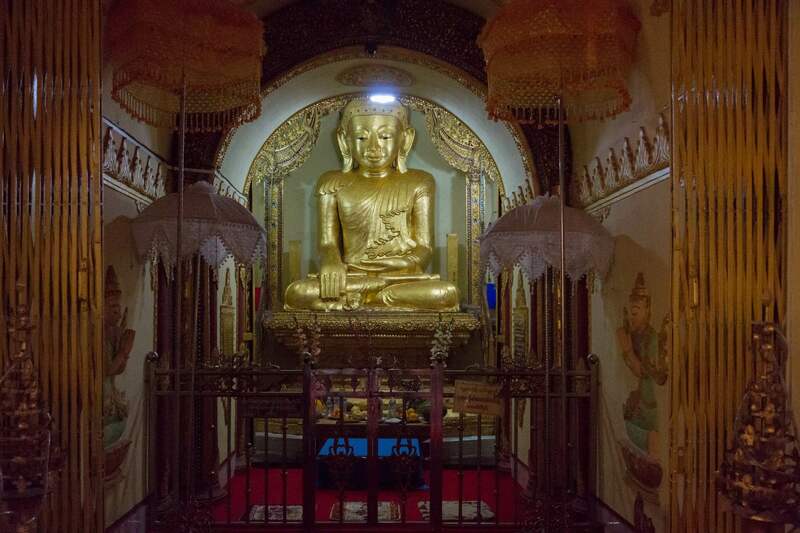 We arrived in Nyaung Shwe by road from Mandalay, after a two-day visit to Kalaw and a detour up to Pindaya to see The Cave of the Ten Thousand (almost!) Buddhas. 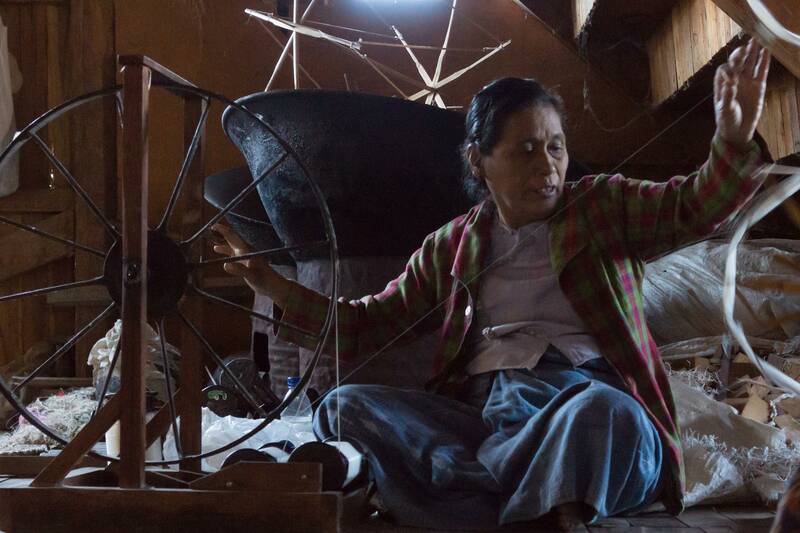 The ramshackle town of Nyaung Shwe has grown into the unofficial center of the Inle lake tourism economy. 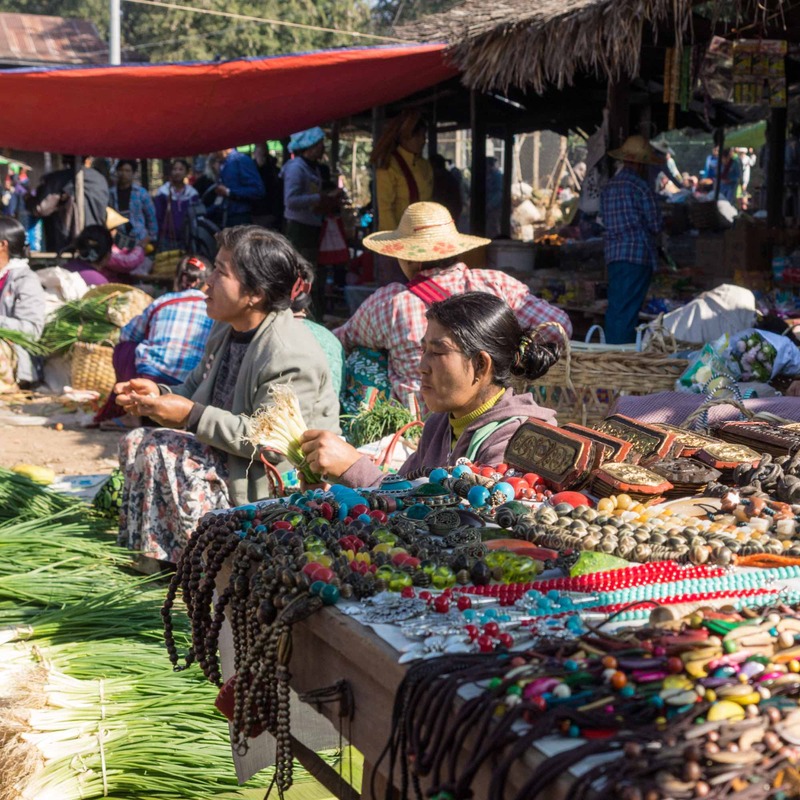 As you enter the Inle Lake zone, there is a 12,500 kyat (about $10. U.S.) visitors’ fee to pay. In town, a wide range of accommodation, numerous restaurants, and tourist agencies line the streets. 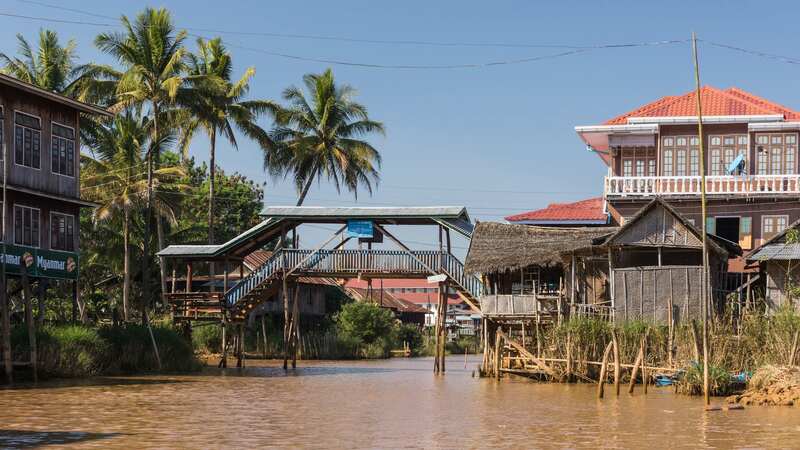 Now that Myanmar has opened itself to the world, towns like Nyaung Shwe and destinations like Inle Lake are attracting investment and seeing rapid development. Our hotel – the Hu Pin – is a fairly new one belonging to the same people who owned the resort on the west side of the lake itself. It seems to be under Chinese ownership. Arriving in Nyaung Shwe at dusk we settled into our rooms and then headed out for a walk through town to the Green Chili, a Thai restaurant large enough to accommodate tour groups. Entering a restaurant as a group of fourteen is another opportunity for people like me to further cultivate a patient attitude! Given my vegan food request, I think I may have chosen the typical combo of plain white rice with stir-fried vegetables. 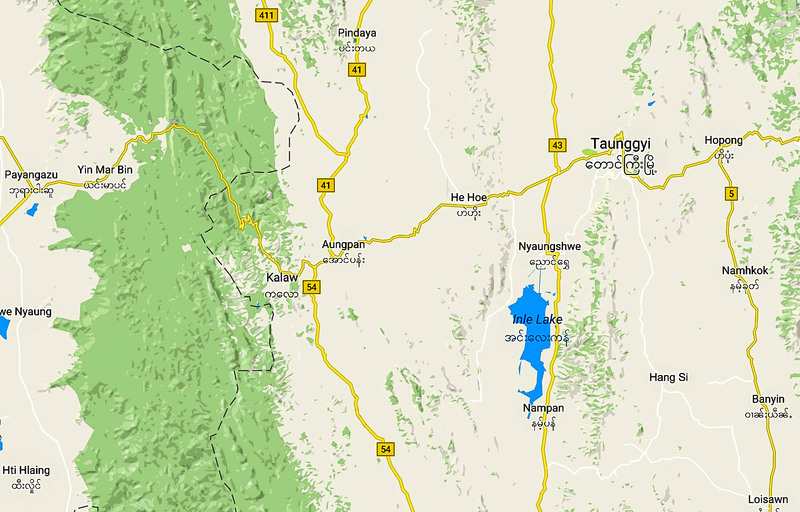 We would spend two nights in Nyaung Shwe. 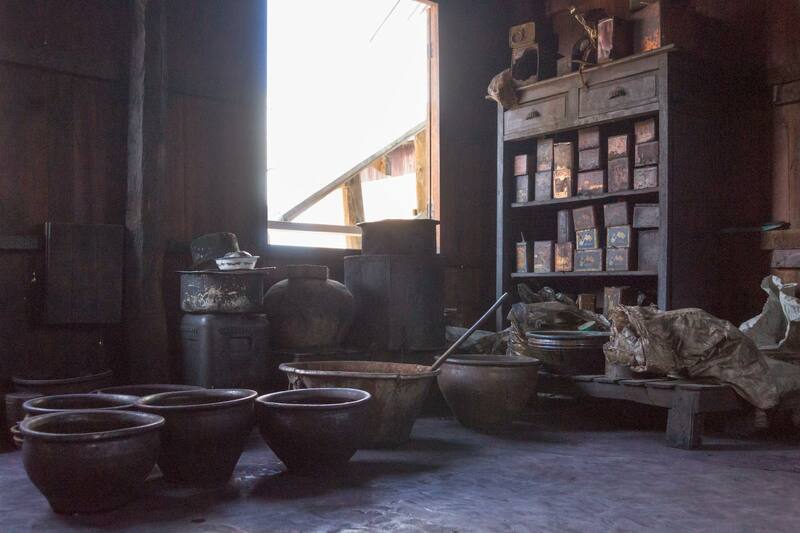 This allowed us to spend an entire day on a hired boat – well, three boats with five persons in each – zipping up and down the lake and visiting various sites. 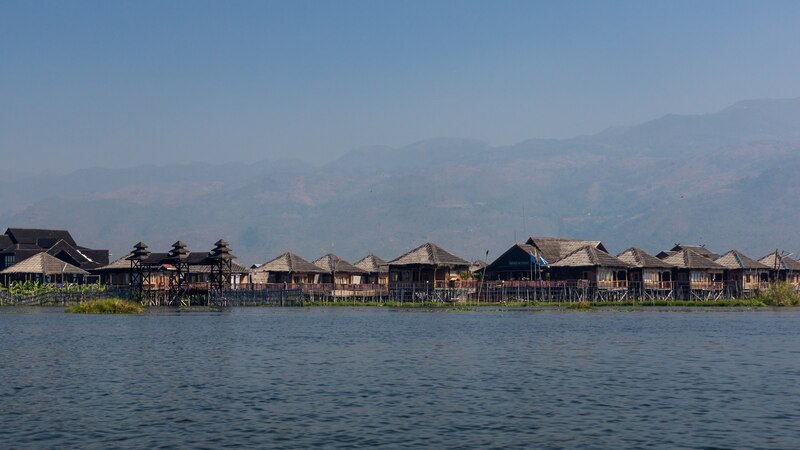 On the second day, we would hop on rented bicycles and cycle down the west side of the lake to Kaung Daing before returning to the hotel and busing over to a winery overlooking the lake for sunset views. 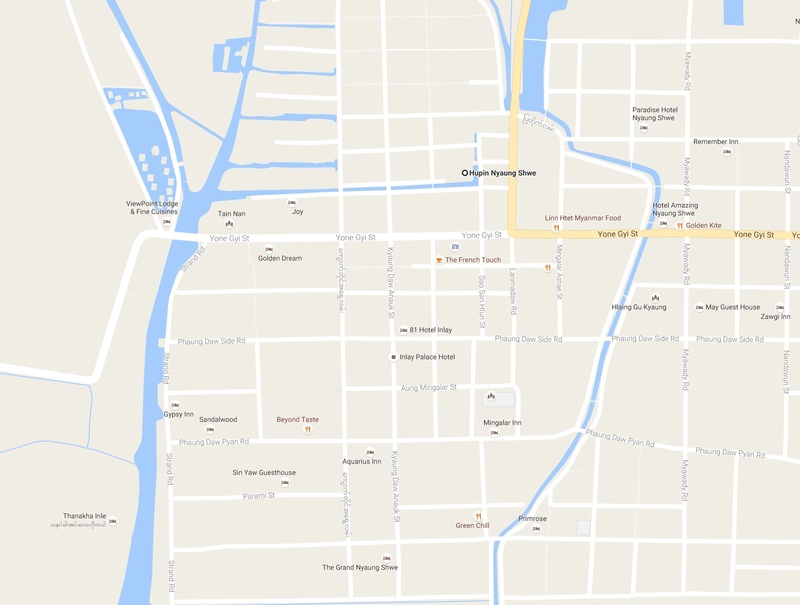 After a short walk down the main street – Yone Gyi Street – to the tour boat docking area near the bridge, we were on the main canal fairly early. 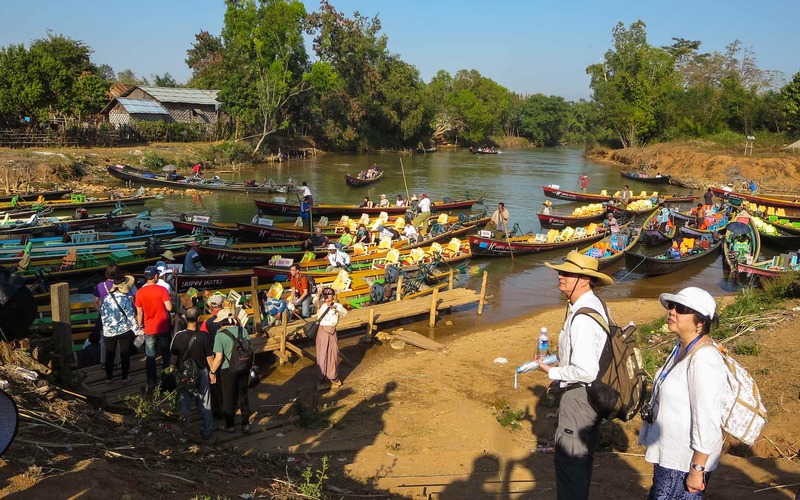 Min our super-guide had already arranged for the boats – long wooden canoes seating five or six with a flat stern on which the outboard motor was attached. 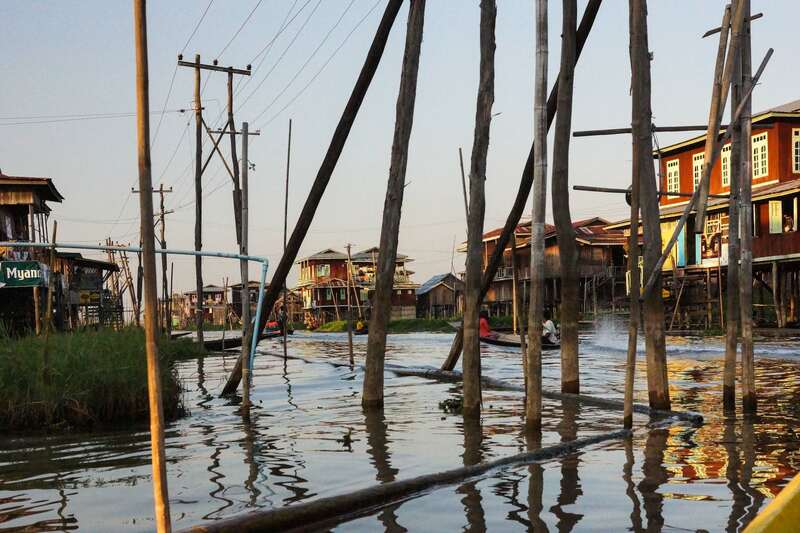 We set off down Nan Chaung (the main canal) to the lake itself. A mist still hung over the waters as we entered the lake. 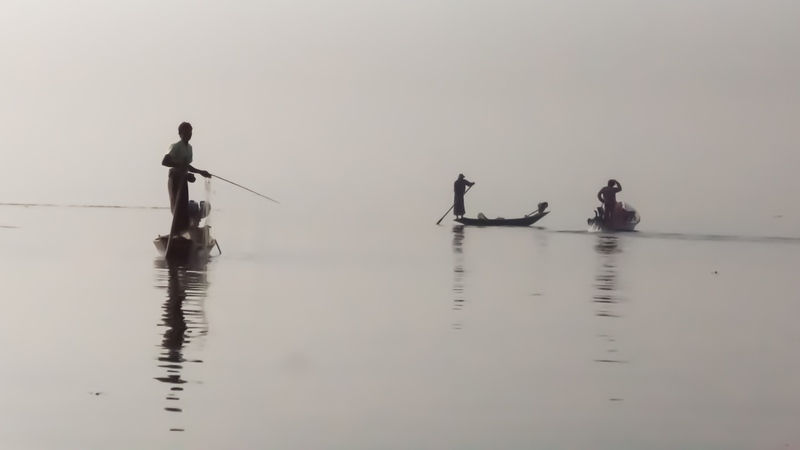 The sound of other tour boats passing by occasionally broke the spell of floating through the mist. The fishermen were there alright – some say provided by the local tourist board! 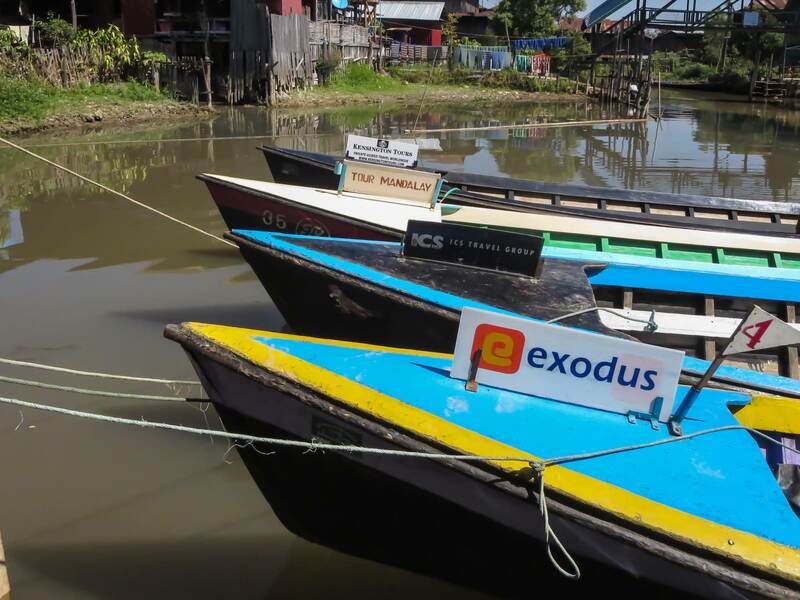 In the image below you see one of our three boats in the background as the Intha carry on with their fishing. It is an idyllic image but there is a troubling reality behind it which makes you wonder how close the lake is to the tipping point. 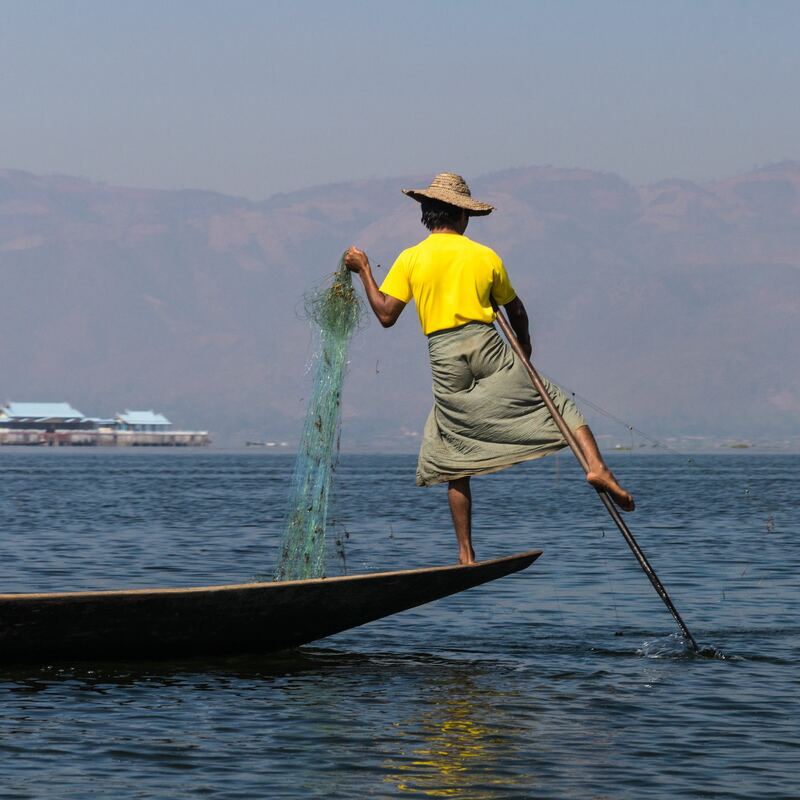 Apparently being an Inle lake fisherman is far from what it was twenty years ago. 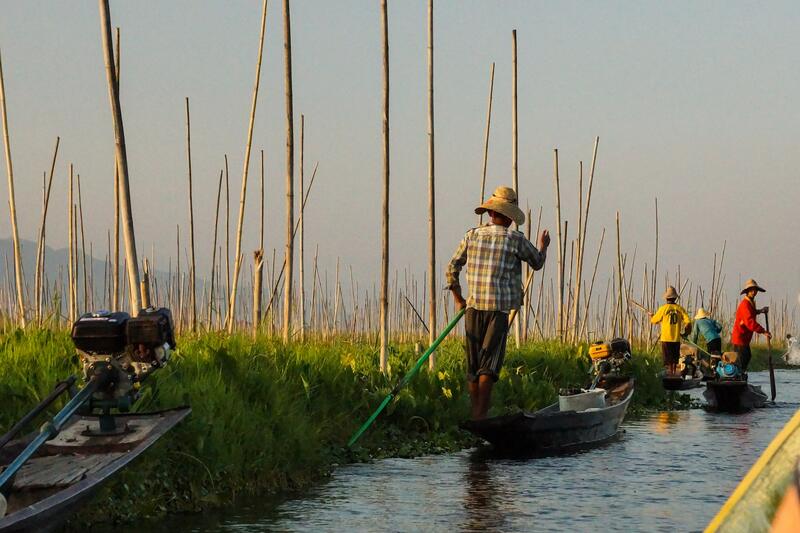 The lake is in a state of crisis: the fish population is declining thanks to the use of pesticides on the floating vegetable gardens. The most prized fish (the Nga Phaing) has all but disappeared and a new and supposedly hardier species (tilapia) has been introduced. 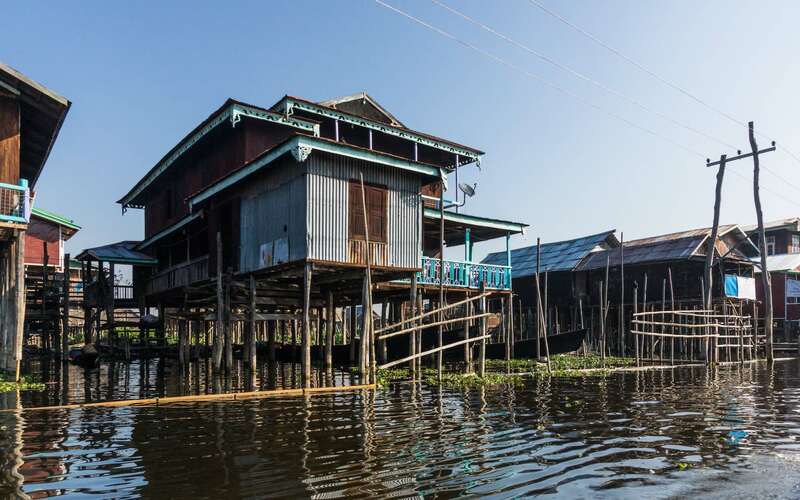 Increasing human population around the lake – Intha houses as well as upscale lakeside resorts – and the resulting deforestation means more run-off silt is ending up in the lake, which has shrunk about 20% since 1990. Meanwhile, many of the 40,000 locals living on or near the lake itself are still putting raw sewage into the water. I did not know any of the above that day as our three boats – and the one hundred others carrying tourists around the lake – zipped along. 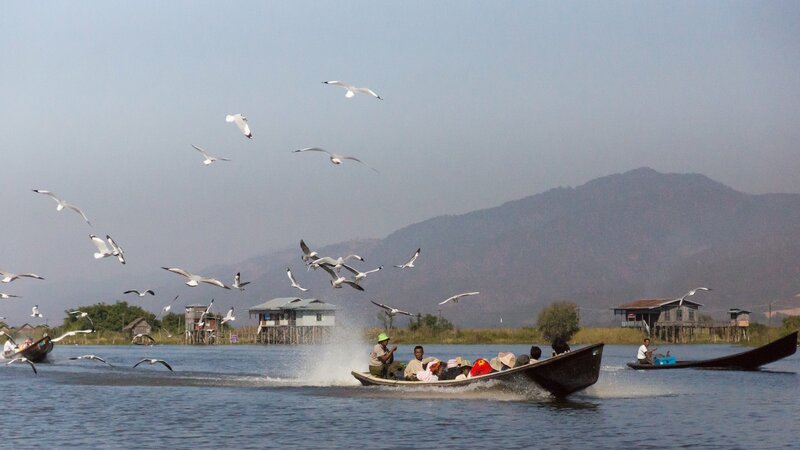 After a few days of stupas and an endless display of Buddhas, zipping down Inle Lake is an invigorating experience. 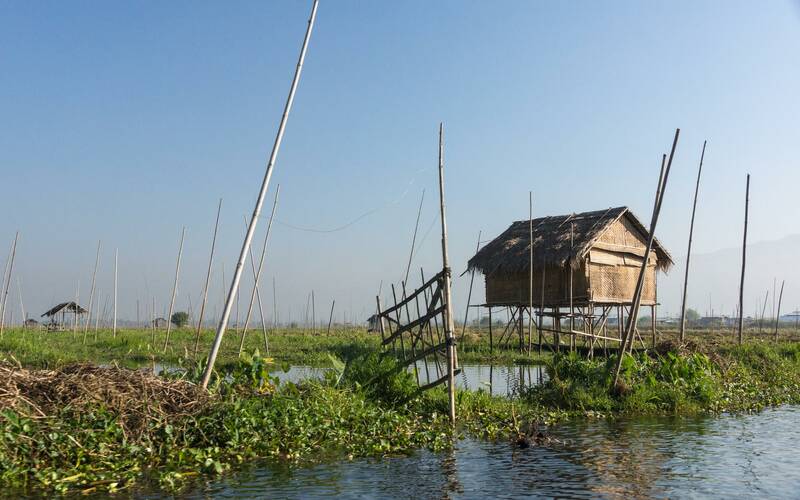 With earplugs and a sun hat and an application of sunscreen, I was keen on capturing some of the magic of Inle in my camera viewfinder. 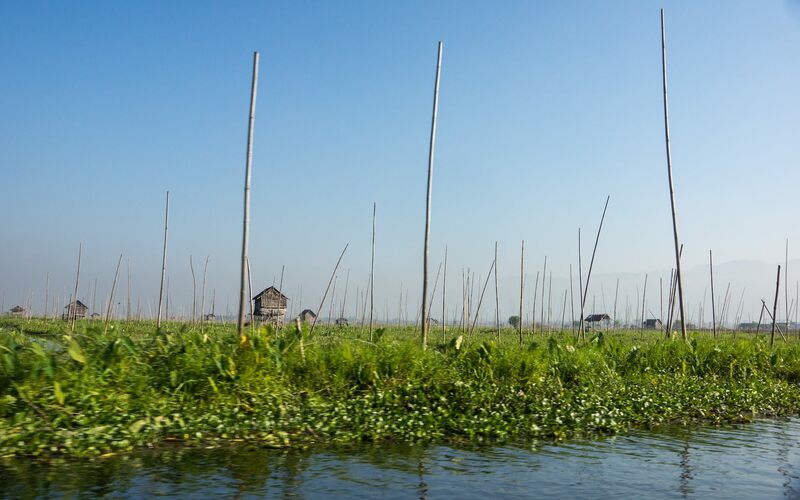 As we approached the landing at Maing Thauk for a visit to the rotating market, we passed by some of the floating gardens that line the shores of the shallow lake. Huts on stilts poked out here and there and added to the scene. 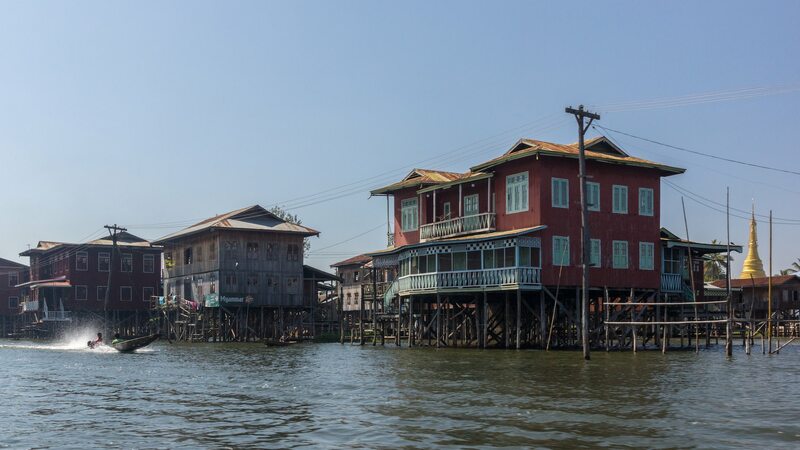 Near the shore the buildings on stilts got more substantial; a string of them was connected to the shore by a raised wooden walkway that went on for a few hundred meters. 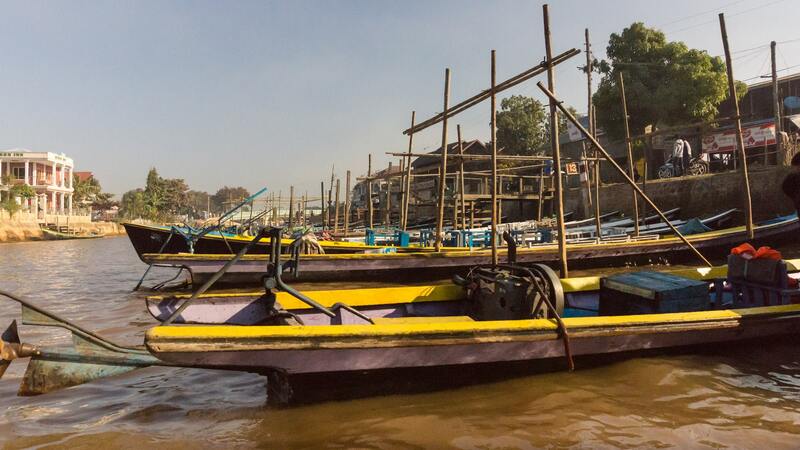 Our boats docked alongside the stilt walkway and we debarked. 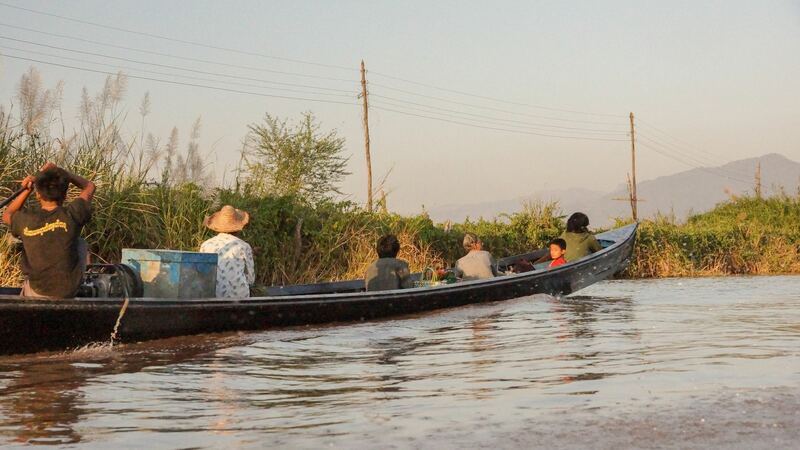 While the village market is also accessible by road from Nyaung Shwe, an early morning boat ride is a more pleasant way to get there. 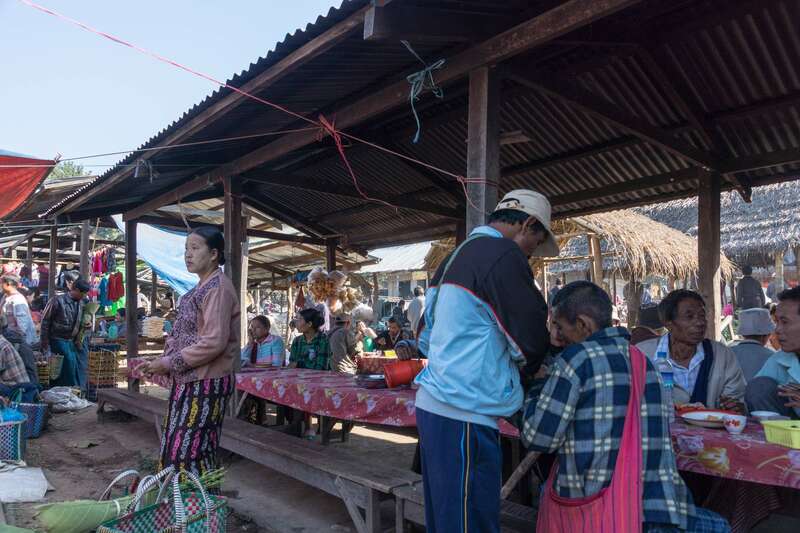 On the plus side, the road access means that more local people from the surrounding hills frequent this market than the ones which are only water-accessible. It would be the first of many stops we made at various points around the lake. As the image below shows, we were not the first! At least a couple of dozen tourist boats were docked along the shore. That would be about 100 non-locals and it was still early! After an hour or so of rambling around the market site, it was time to move on. 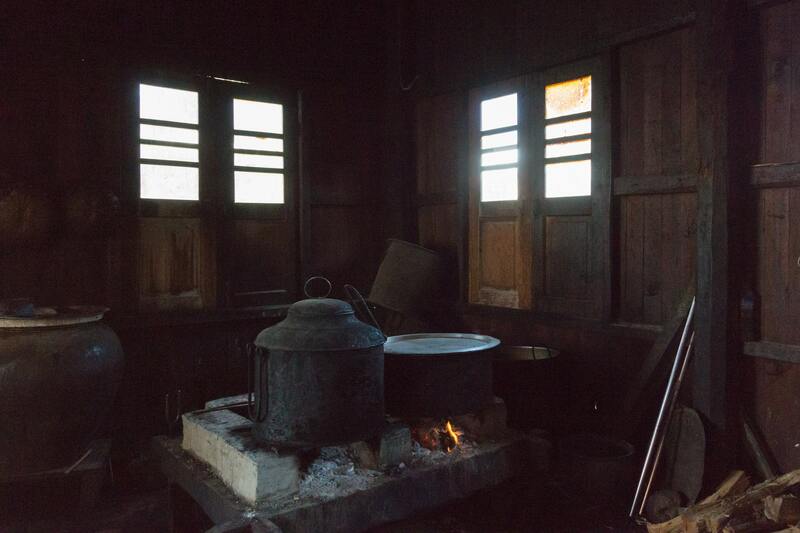 We were off to visit a string of crafts cottages specializing in weaving, silverware, and blacksmithing. As we made our way south down the lake we passed a few resorts that have sprung up to cater to the tourist trade. 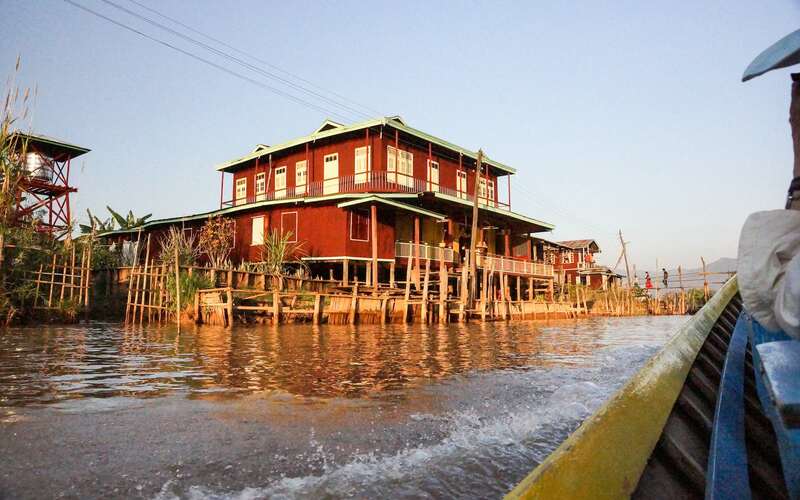 The one below made good use of the iconic stilt cottage. 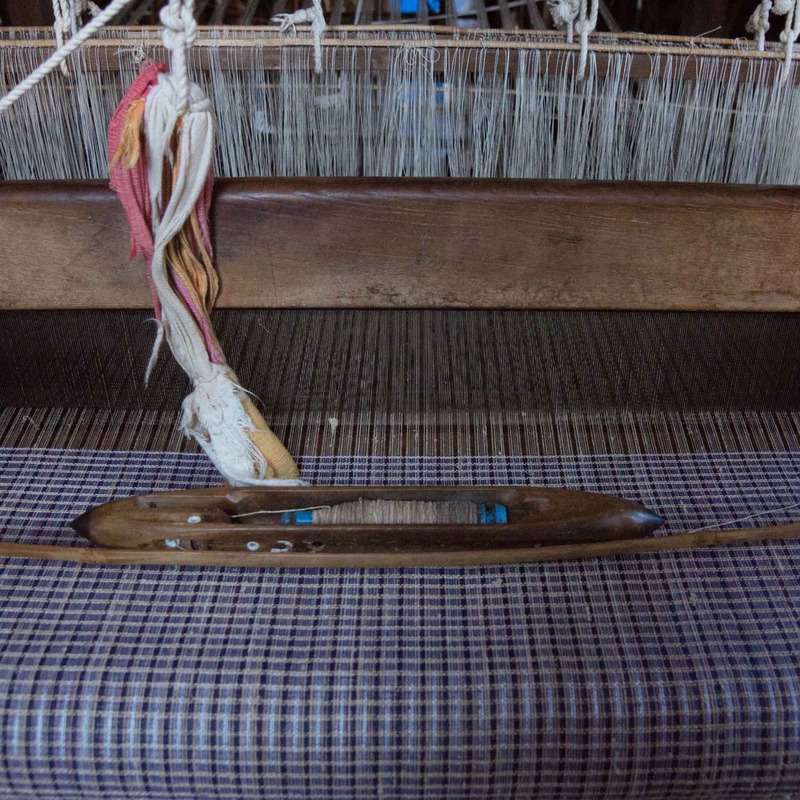 At the south end of the lake and up a narrow river we came to the village of In Phaw Khone known for its textiles. 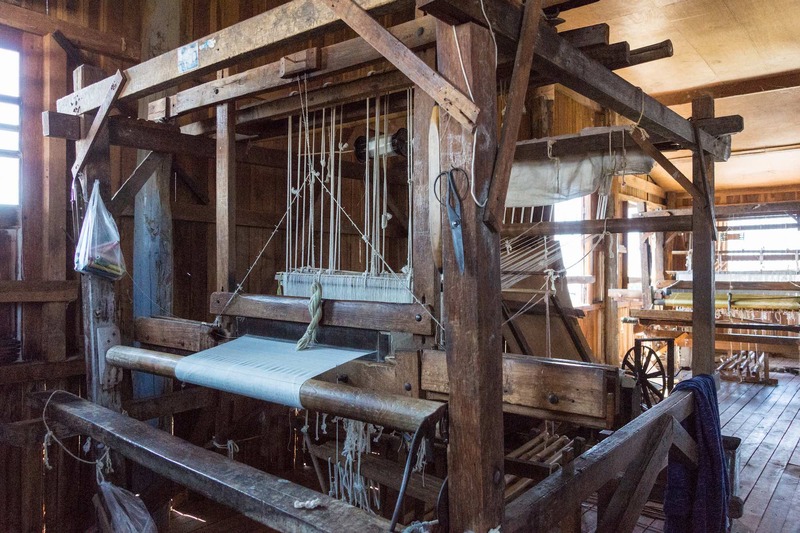 Entering the weavers’ work cottage, we came face to face with loom frames that looked like they had come out of the early twentieth century. 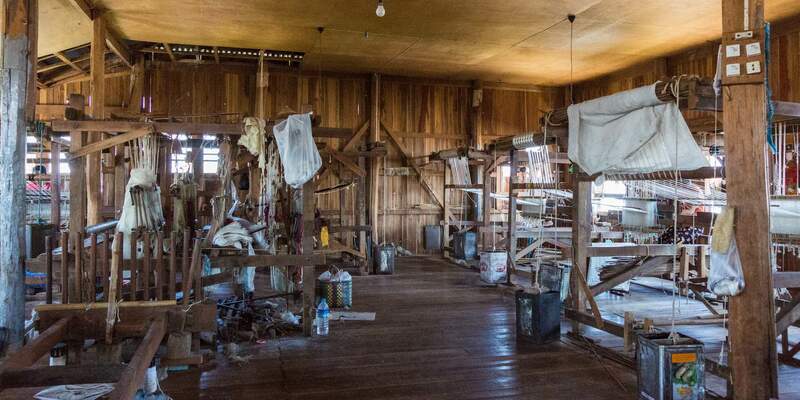 The foot-power looms were operated by experienced weavers. 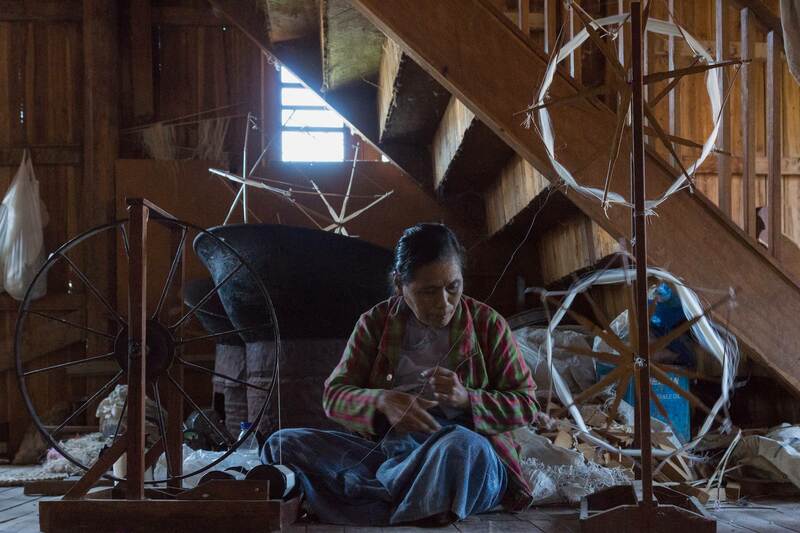 It was all quite impressive and brought home the ingenuity of people making use of what they have to create beautiful things, in this case, textiles. 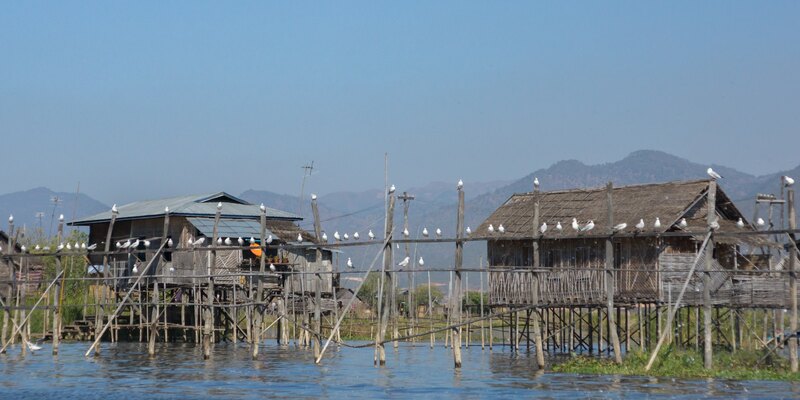 The boat below with the Exodus marker belonged to our group but given the popularity of the weavers’ cottage on the Inle tourist circuit, we were clearly not the only visitors! After the obligatory stop at the shop connected tot he weavers’ cottage, we were off to the next crafts location in our hired boat. 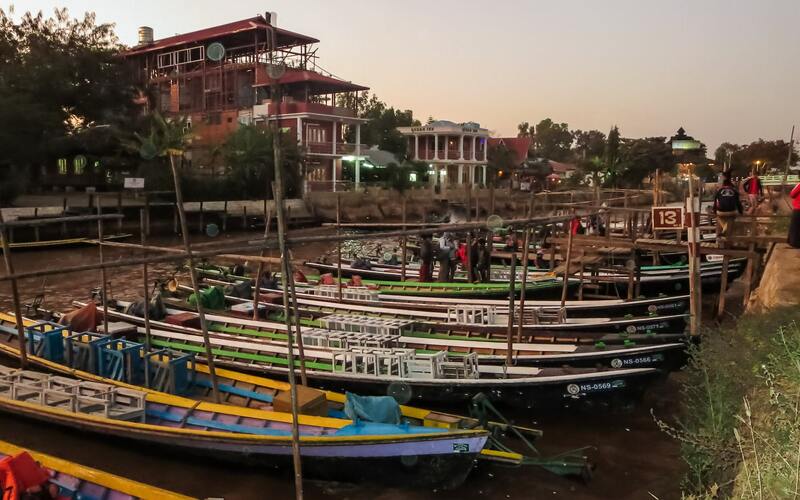 Many Intha fishermen have, given the declining fish stocks, moved on to the more lucrative tour boat business. Bright paint colours, padded seat cushions, and a more powerful boat engine – and they are ready to moor tourists around the lake. the change has been swift enough, however, that many of the boat drivers lack the foreign language skills needed. 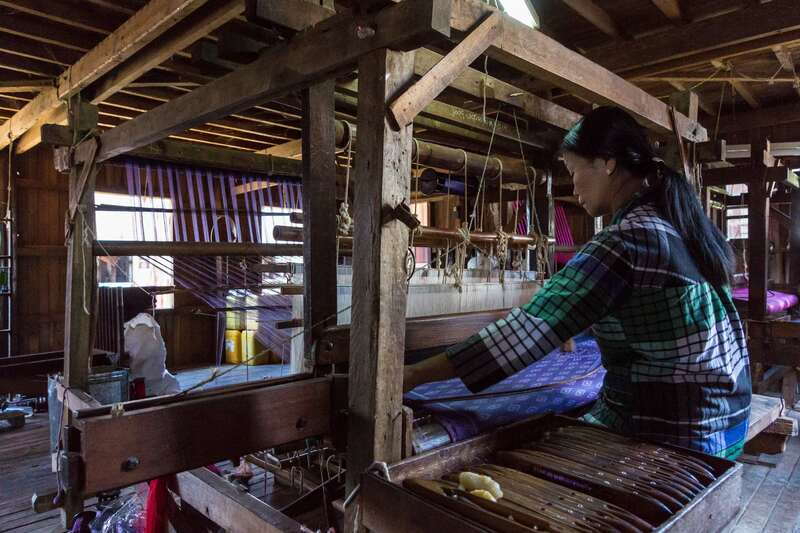 Already in the schools of the Inle region, English-language classes are providing the basics to students and to locals already involved in the tourism economy. 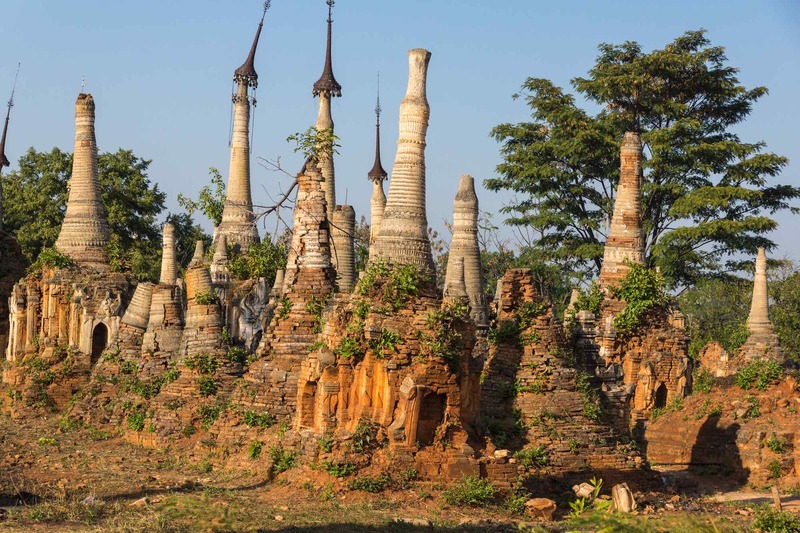 After all the crafts studios and gift shops were done it was on to the final destination of the day, the thousand zedis or stupas of In Thein (also spelled Indein in English). The following pix give some idea of the scenery along the way. 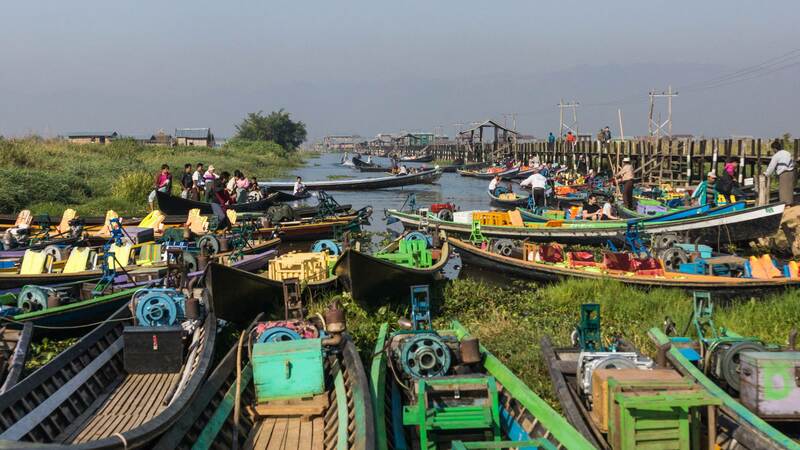 The landing for Inthein was jammed with perhaps two dozen tourist boats. As we were coming in others were departing; it was somewhat jarring after a tranquil (except for the hum of the boat motor) ride through the backwaters from the lake itself. 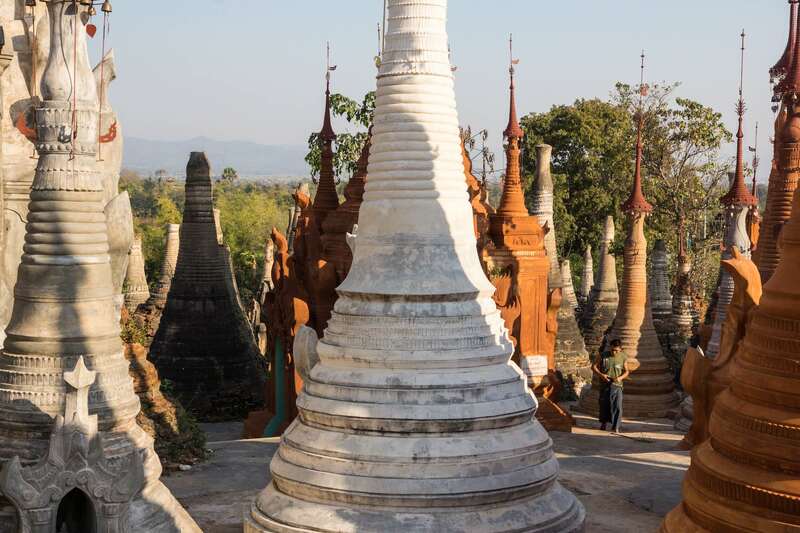 A short walk from the landing is what could be called a Burmese field of karmic merit, a place where Buddhists over several generations had brick zedis or stupas constructed in hope of gaining extra karma points that would serve them well in their next lifetime. 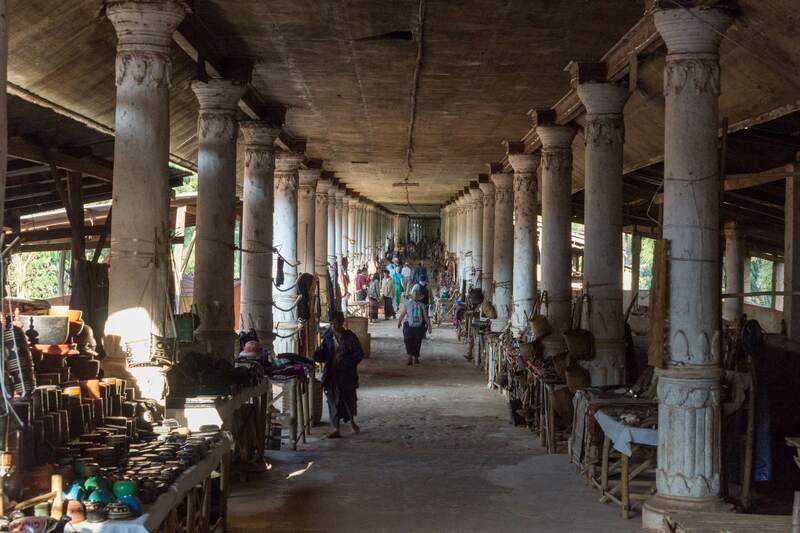 While a humbler version of what went on in the Bamar capital of Bagan for a couple of centuries, it is still an indication that the surrounding area was able to generate enough surplus wealth to allow such an allocation of labour and material resources. 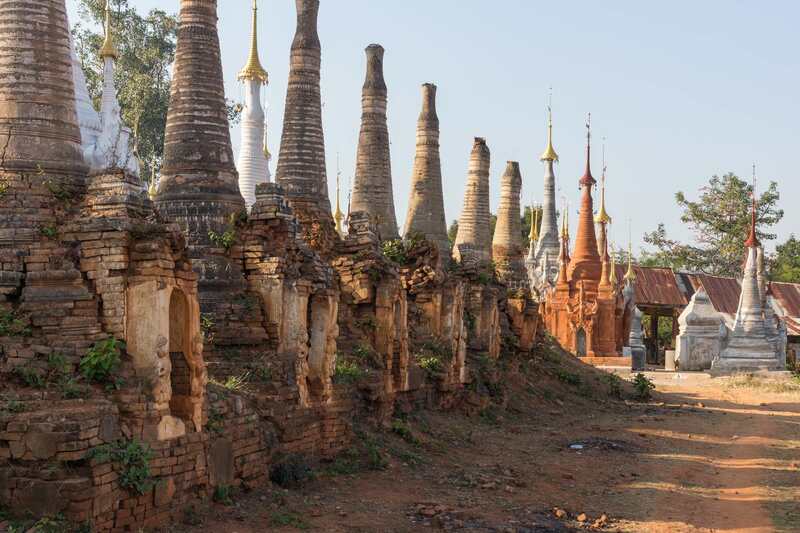 Of the 1054 stupas or zedis inventoried, the ones below were the first we approached. 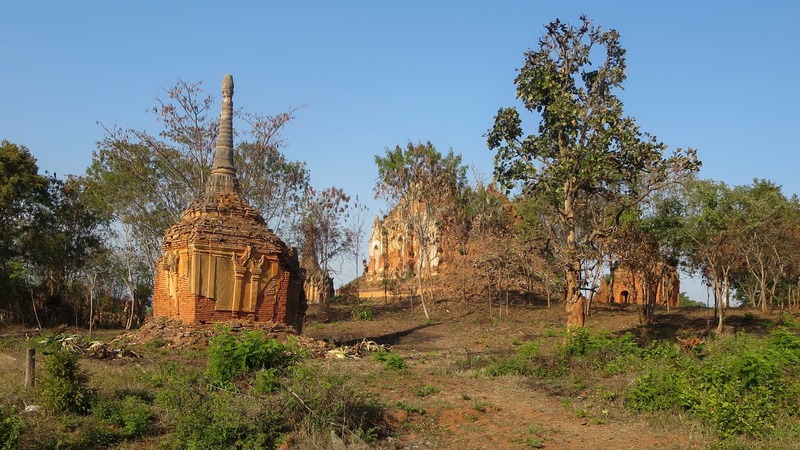 We would find many of them crumbling and tilting and, every once in a while, evidence of some reconstruction or even completely new stupas as yet another generation of believers earns those needed karma points. Nearby was a temple that I peeked into before we made our way down the covered passageway from the temple back towards the boat area. It was already late enough that many of the vendors were packing up their wares. Into the boat one last time! Each time we embarked we made a point of changing seats so that everyone would get a chance to sit right at the front and second and so on. I settled into my seat and upped the iso of my camera so that I could get some shots as we motored our way back to the Nyaungshwe dock. The shots I got were my favourite of the day – the fading light and the angle at which it hit the water and bounced off the buildings may have had something to do with it! maybe that is what photographers mean by the phrase “the golden hour”? 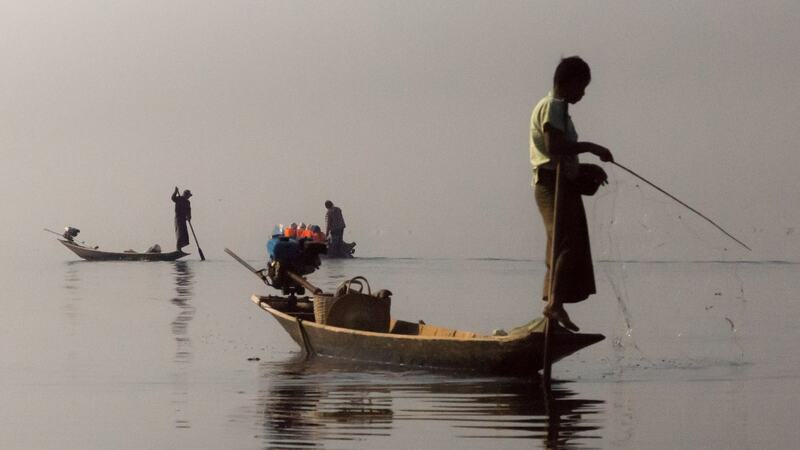 Everyone agreed that it had been an excellent day both in terms of the beauty of the lake itself and as a celebration of the ingenuity of the Intha people who make the lake and its shores their home. 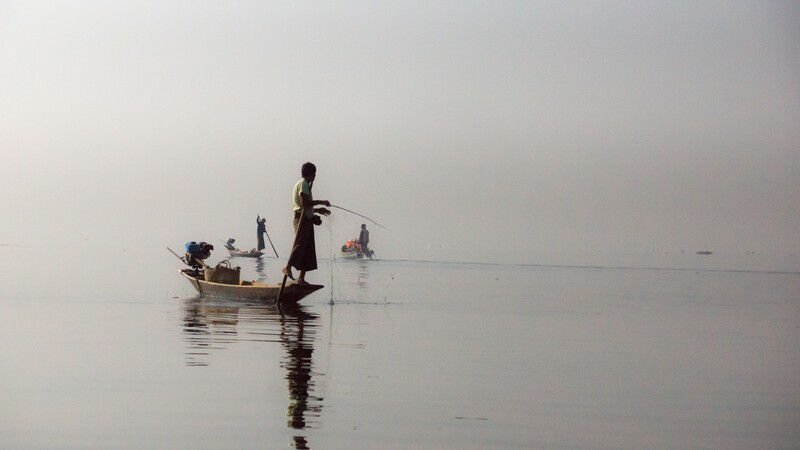 In the back of my mind was the thought that I was seeing something that is on the verge of being lost thanks to the environmental and -yes – touristic – stresses being placed on the lake and its inhabitants. 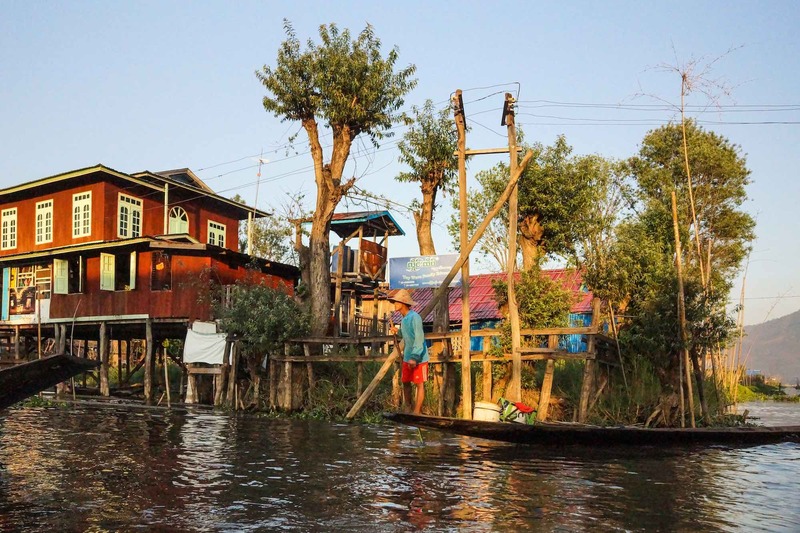 Instead of getting around by boat, we take to bicycles and visit some nearby villages on the west side of the lake and then bus over to Red Mountain Estate to sip on wine as we watch the sunset. Just curious now that I see you are/have been travelling in Asia. Were you, by any chance, in Hong Kong on June 20? Star ferry from Kowloon to the island around midday? Biff, greetings from Toronto! Alas, no H.K. since 2002! On June 20 I was paddling in Georgian Bay. See here!